This Whole30 sweet potato hash makes for a delicious morning meal. 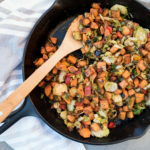 Caramelized sweet potatoes, flavorful red peppers, and Brussel sprouts are the stars! Melt ghee in large skillet or warm the olive oil. Saute onions and garlic till fragrant. Add in the diced sweet potatoes. Season with a little salt + pepper. (like 1 tsp of salt and 1/2 tsp pepper). Try not to stir too frequently; we want to get good color on those sweet potatoes! Cook for maybe 8 minutes, stirring only occasionally. Add in the red peppers, cook for 3 minutes. Make a well in the middle of the potatoes and peppers and add the brussel sprouts. Season entire skillet with garlic powder, onion powder, parsley, and more salt+ pepper. Cook for 4 minutes. *If you diced your potatoes fairly small, you might not need this step. The potatoes should be fork tender!If you’re cooking for two, just halve the recipe!